$10 Laser Engraving TODAY!!! Free Shipping on Orders Over $449.95! 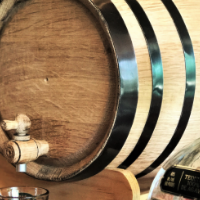 Your choice of hoop ... black or galvanized ... has nothing to do with how your contents will age - all of our barrels use the same American white oak and are toasted in the same manner ... basically, it's just how they look aesthetically. The black hoops are a painted black steel. 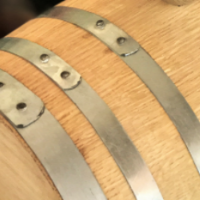 They are more susceptible to rust and if the outside of the oak barrel gets wet, the paint has a tendency to feather-out and stain the barrel adding to the rustic character of the black-hooped barrel. If your preference leans towards a neater, cleaner look ... the carefree galvanized-hooped oak barrel is the one for you.